Hi there! It's so nice to be back behind the keyboard. I've been away from the blog for a little while working on some very exciting projects. I have lots of new online designs to share and also a few dramatic room makeover reveals! Now that these projects are complete, I can get back to blogging about them! Starting today...I recently completed a "Re-Fresh" of the main level of my own home. What is the difference between and room makeover and a re-fresh? As opposed to a full blown room makeover, a re-fresh is a way to give a space a new look with just a few tweaks. I was able to give my home a fresh, new, style for spring with only five simple changes. After a long, cold, Michigan winter, my living room requested some bright, cheerful color. I obliged by bringing in a new area rug. This singular change instantly livened up our space. 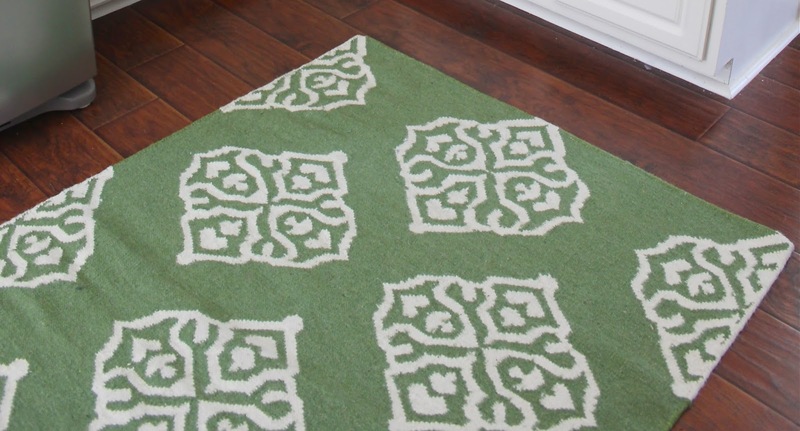 Adding this rug felt like a breath of fresh, spring air. To allow as much of the beautiful new rug to show as possible, I switched out our large, black, heavy, wooden coffee table for a lighter, smaller scale, glass top table. This coffee table has been in our storage area since we were first married. It belonged to my husbands Great-Grandmother. It's nice to have this piece of his family history in our family room, not to mention I am in love with the way it looks. To complement the new rug, I added a few apple green toss pillows to the sofa's and chair. These beautiful, linen pillows are simple in design, yet they add so much to the space. The injection of color is just what our white, slip-covered sofa's needed. The solid green linen pillows provided a nice break from the patterns found in the zebra print chair and striped toss pillows. Speaking of taking a break in pattern...the next element that I changed up was the drapery. Over the last few years, I've enjoyed my DIY Bold Striped Drapes in this space. When I started this re-fresh, I decided it was time for a change. Something a little simpler in design would allow my new rug to be the star of the show. A tutorial on my new black and white DIY No-Sew Color Block Drapes will be coming soon. You won't believe how easy and how budget friendly these were to make! The fifth and final change I made in this Re-Fresh was a new paint color, Sherwin Williams "Anonymous". It's a dramatic, deep, moody gray. I love how it provides contrast to all of the white in the space. 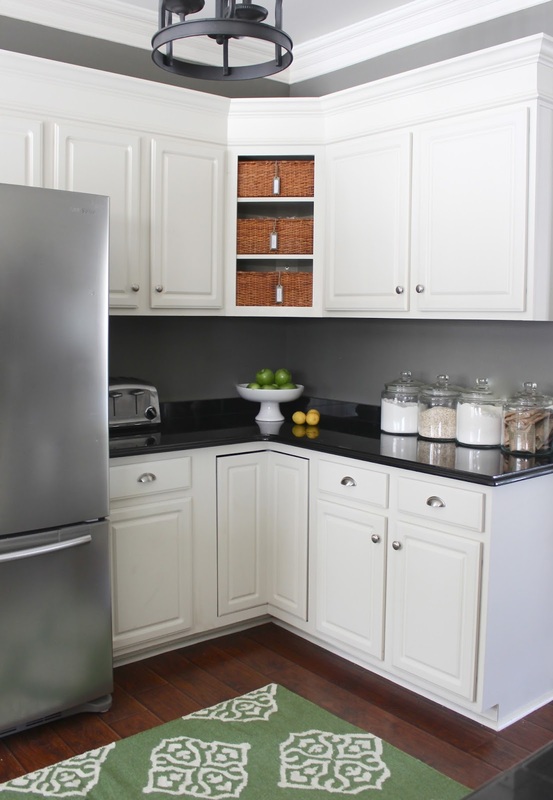 This is a great example of how a dark wall color doesn't always make a space feel darker. It can actually have the opposite effect by highlighting the lighter elements in the room. Since we have an open concept floor plan, I carried the same "Anonymous" wall color throughout most of the main level. In the kitchen, this color really showcases our painted cabinetry. I added a smaller version of the rug in the living room to the kitchen as well. This helps to tie the two spaces together. This little area rug had a big impact on our small kitchen. The bright, apple green color and large scale pattern brought a ton of personality and energy to the space. At the tail end of a long Michigan winter, I'll take a little energy anywhere I can get it. This rug is a great choice for a kitchen for a few reasons. The first reason is that it is 100% wool. Wool is naturally stain resistant. The second reason this rug is great for a busy family kitchen, is that it's reversible! It looks exactly the same on both sides. *I'm now available for new online design projects. Please click here for more info. I'm a big fan of your style! I love the bright & bold, yet straight to the point decor & style! So lovely !! Happy Friday!! 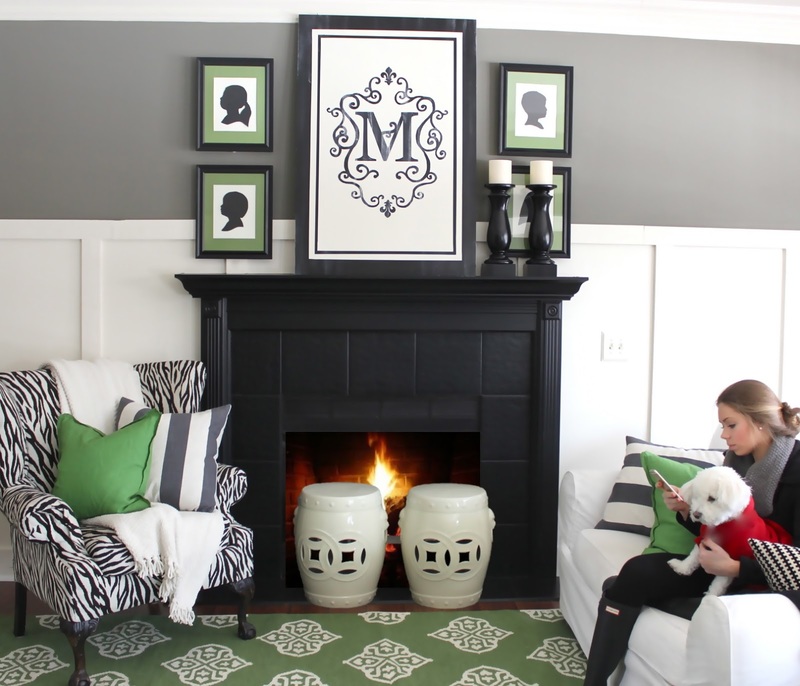 Love the rug, and apple green in general. Can I ask why you chose to have the silhouettes facing away from the center? It makes me think they are mad at each other....I'd have them switch sides,so they are facing the center. Great lampshade color. I love how your room looks with the pops of green and the gray walls! LOVE your Green "Refresh"!! Green's my favorite color!! GREAT JOB!!!!! !